What’s better than new furniture? New furniture with no interest till 2017! Visit our online store or drop by in person today to pick out the perfect new look for your home! 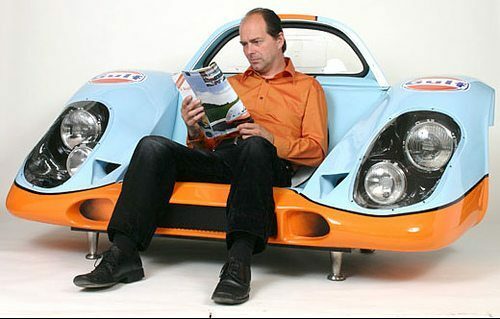 Looking for something a little more…unusual to spice up your home, furniture wise? We’ve gathered some photos of interesting pieces that are sure to make your house stand out so have a look below! Are you having as much fun as we are exploring the history of American made furniture? We hope you are! 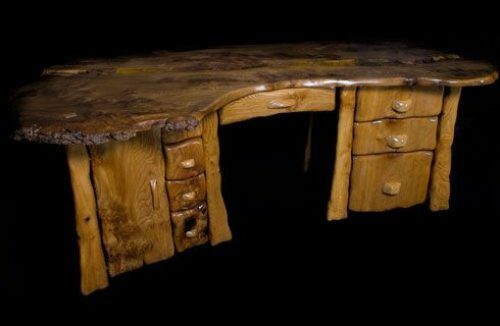 In today’s blog we’ll take a look at a style of furniture that was around at the same time as the Victorian Style Era – Arts and Crafts furniture, also known as Mission style or Craftsmen style. This style is characterized by rectilinear design, simple, straight construction, and exposed joinery, often using medium or dark stained oak. Arts and Crafts was an international design movement that was led by artist and writer, William Morris during the 1860s and inspired by the writings of John Ruskin and Augustus Pugin. While it first developed in the British Isles, it quickly spread to North America. This movement was largely a reaction against the impoverished state of the decorative arts at the time as well as the conditions in which they were produced and challenged the tastes of the Victorian era. It stood for traditional craftsmanship using simple forms and often applied medieval, romantic or folk styles of decoration. It advocated economic and social reform and has been said to be essentially anti-industrial. In Europe, the Arts and Crafts style was created with the goal of produce beautiful objects that would enhance the lives of ordinary people, and at the same time provide decent employment for the craftsman. 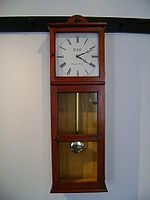 However, in time the English Arts and Crafts movement came to stress craftsmanship at the expense of mass market pricing. The result was exquisitely made and decorated pieces that could only be afforded by the very wealthy. Thus the idea of art for the people was lost, and only relatively few craftsman could be employed making these fine pieces. In the US, however, the idea of this movement was more fully actualized. The Stickley Company in New York was trying to serve a burgeoning market of middle class consumers who wanted affordable, decent looking furniture. By using factory methods to produce basic components, and utilizing craftsmen to finish and assemble, he was able to produce sturdy, serviceable furniture which was sold in vast quantities, and still survives. Why was this style also referred to as “Mission style” in the US? This term reflects the influence of traditional furnishings and interiors from the American Southwest, which had many features in common with the earlier British Arts and Crafts forms. This style incorporated Hispanic and Native American influences into the designs. In fact, the collecting of Southwestern artifacts became very popular in the first quarter of the twentieth century partially because of these influences. Join us next time as we look at the Art Noveau movement! In the meantime, we hope this look to the past has inspired you in any decorating endeavours you’ve had in mind. Drop by our showroom today so we can help you pick out the perfect furniture style, vintage or new! Last time on The History of American Made Furniture, we discussed the Shaker style known for its simple and conservative style of design. The basic look had many straight lines and very simple knobs and other elements and was originally produced by a religious group in the United States. Today we’ll take a look at what followed the Shaker style – the Victorian style era. The Victorian style was named after Queen Victoria of England who ruled in the late 1800s and as popularized from 1840 to 1910. Victorian furniture was known for having darker finishes and very elaborate and ornate designs. In fact, the Victorian age furniture draws its influence from gothic forms with heavy proportions, dark finish, elaborate carving, and ornamentation. Victorian age furniture has a strong Rococo and Louis XV influence. Exaggerated curves, lush upholstery and decorative carvings are featured. 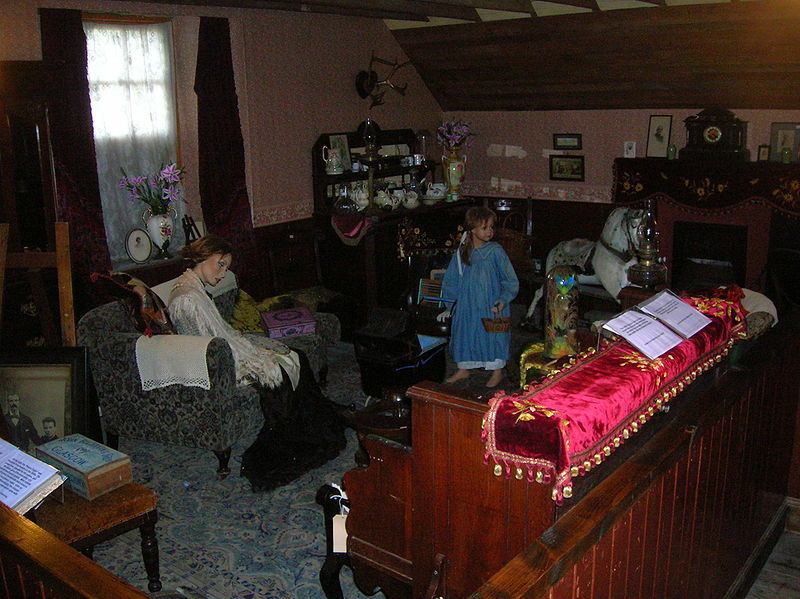 Below you’ll find a Victorian bedroom and sitting room. 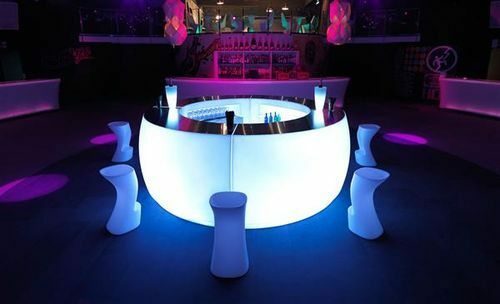 During this era, manufacturing of furniture due to the industrial revolution and changes in technology, became easier. Mass production was now viable. 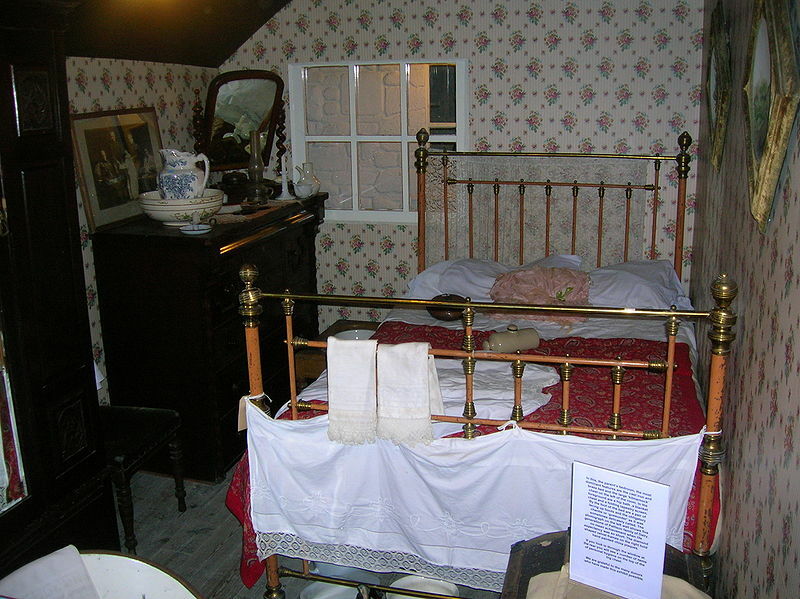 Because of these changes in production, Victorian style furniture was more readily available to consumers. If you’d like to learn more about the specifics and details of the Victorian Style, you can visit Connected Lines. And if you’re looking for furniture of your very own, stop by our shop or visit us online today! Continuing our look at the history of American made furniture, today we’ll look at Shaker furniture which came about in the same era as Empire style. The Shaker style is a simple, utilitarian style characterized by straight tapered legs, woven chair seats, and mushroom-shaped wooden knobs. It was produced by the religious group the United Society of Believers in self-contained communities in the United States. The Shakers came to America from Manchester, England in 1774 and Shaker designs were inspired by the ascetic religious beliefs of the Society. Shakers made furniture for their own use, as well as for sale to the general public. 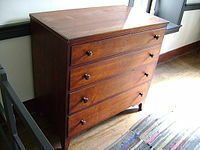 Many examples of Shaker furniture survive and are preserved today, including such popular forms as Shaker tables, chairs, rocking chairs (made in several sizes), and cabinets. 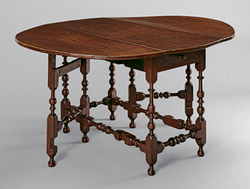 Collections of Shaker furniture are maintained by many art and historical museums in the United States and England, as well as in numerous private collections. The underlying principles of Shaker design have given inspiration to some of the finest designers of modern furniture. Also many ideals of furniture formed around the common Shaker furniture construction. And if you’re really interested in the Shaker movement, you can visit this website to see a style guide that goes into detail about each aspect of the Shaker styles! 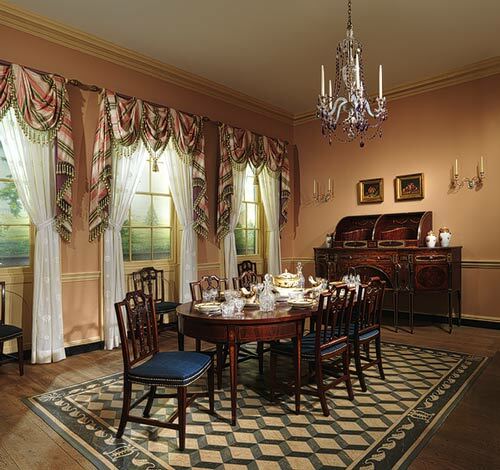 We hope you’re having as much as we are exploring the history of American furniture! 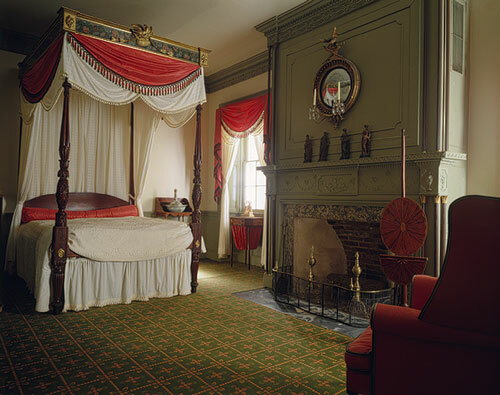 We last took a look at the Federal/Neoclassical era which featured such rooms as the Haverhill Room. 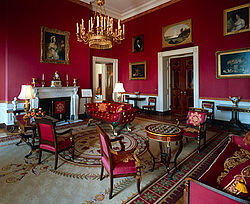 The clean lines, delicate forms, geometric shapes, contrasting veneers, and decorative inlays of Federal-period furniture represent a dramatic shift away from the sinuous Rococo carving that had typified American decorative arts for the previous thirty years and found in period rooms from the second half of the eighteenth century. Today we’ll look at American Empire which was a French-inspired Neoclassical style of American furniture and decoration that takes its name and originates from the Empire style introduced during the First French Empire period under Napoleon’s rule. American Empire style gained its greatest popularity in the United States after 1810 and is technically considered a more robust version of the Neoclassical period. As an early-19th-century design movement in the United States, it encompassed architecture, furniture and other decorative arts, as well as the visual arts. The Empire style was most notably exemplified by the work of New York cabinetmakers Duncan Phyfe and Paris-trained Charles-Honoré Lannuier. 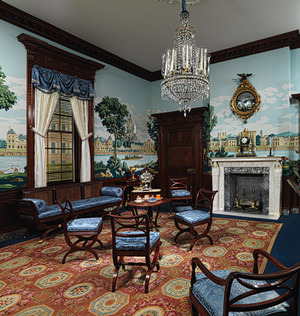 Other major furniture centers renowned for regional interpretations of the American Empire style were Boston, Philadelphia, and Baltimore. Characteristics of the American Empire style cabinet making include antiquities-inspired carving, gilt-brass furniture mounts, and decorative inlays such as stamped-brass banding with egg-and-dart, diamond, or Greek-key patterns, or individual shapes such as stars or circles. As time passed, this style became more elaborate, particularly between 1815 and 1825, and grew to include columns with rope-twist carving, animal-paw feet, anthemion, stars, and acanthus-leaf ornamentation, sometimes in combination with gilding and vert antique (antique green, simulating aged bronze). The Red Room at the White House is a great example of this. There was also a simplified version of the American Empire style referred to as the Grecian style. This style plainer surfaces in curved forms, highly figured mahogany veneers, and sometimes gilt-stencilled decorations. Many examples of this style survive, exemplified by massive chests of drawers with scroll pillars and glass pulls, work tables with scroll feet and ‘fiddleback’ chairs. Elements of the style enjoyed a brief revival in the 1890s with, particularly, chests of drawers and vanities or dressing tables, usually executed in oak and oak veneers. Stay tuned for more furniture facts and fun and if there’s anything you’d like to learn more about, leave us a comment or email and let us know! Remember you can always drop by our website or come by our store anytime to find the perfect set of furniture for yourself! In our last blog post, we took a look into the history of American made furniture starting with the 1600s and going till the 1700s. The predominant styles then were the Seventeenth Century style and the William and Mary style. So what were the main styles from the 1700s to the 1800s? Queen Anne and Chippendale were the two big styles in this era. During the second quarter of the eighteenth century, the bold turnings, attenuated proportions, and dynamic surfaces of the Early Baroque, or William and Mary, style were subdued in favor of gracefully curved outlines, classical proportions, and restrained surface ornamentation. This style came to be known as Queen Anne. 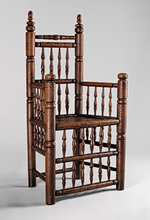 In the early 18th century, Boston was the reigning colonial city and the first to start using the Queen Anne style by making chairs with a “crooked” or S-curved back that conformed to the shape of the sitter’s spine. The S-curve was borrowed from Asian designs and reflected a trend towards comfort in furniture, a far departure from the stiff, straight chair backs of the era before. Thousands of these chairs were made and then exported to the other colonies. In Philadelphia, craftsmen took the design a step further by developing distinctive seating forms with more elaborately curved lines. Revealing the Late Baroque emphasis on negative space, the solid splat and the flanking stiles were carefully designed so as to produce a gracefully curved void between them. Case furniture such as dressers, chests and dressing tables became more architectural as time went on with proportions and ornamental designs being derived from their Renaissance forerunners. Boston furniture makers were incorporating cabriole legs and broken-scroll pediments into high chests of drawers by 1730 while in Rhode Island cabinetmakers integrated distinctive scrolls and scalloped shells into the skirts of high chests and dressing tables. One exception to this ornamentation was “japanning”, a technique developed to imitate Asian lacquer work. Also used was “chinoiserie”, which was the painting of fantastical scenes on furniture. By now colonies were trading amongst themselves, enabling the spread of different styles and materials. The most popular wood used during the Queen Anne period was black walnut while the most used wood during the Chippendale period was walnut stained to resemble Caribbean mahogany. The Chippendale period was also known as the Rococo period due to the publication of Thomas Chippendale’s The Gentleman and Cabinet Maker’s Director, a book that reflected the growing influence of the French Rococo style, which found expression in America in overlays of playful, naturalistic carving. 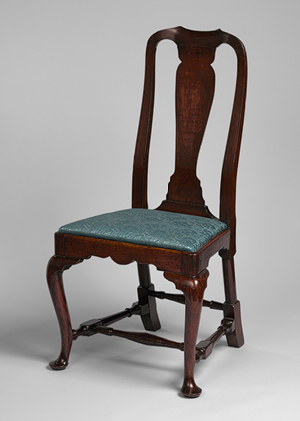 Chairs in the Chippendale style became more rectilinear, with square seat frames, straight stiles, and outward-flaring “ears” at the top corners. Claw-and-ball feet with sharply articulated talons replaced the smooth contours of pad and slipper feet. Back splats, formerly solid and unornamented, came to be pierced and intricately carved with foliage and interlaced patterns. 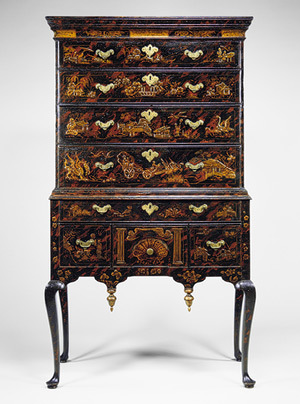 In case furniture, the Chippendale style was just an extension of the Queen Anne style such as a high chest of drawers being updated with carved Rococo ornamentation. Now was also the time when leisure activities were finally a part of life. The result was cabinetmakers produced specialized furniture forms such as tables for playing cards and taking tea. These pieces increasingly took on bold three-dimensional shapes and often rested on leaf-carved cabriole legs ending in claw feet. The transition from Queen Anne to Chippendale in the colonies wasn’t fast or universal. Outside any major cities, any changes were small and at times hardly noticeable. By the 1780s however, a new style was starting to emerge and that’s what we’ll visit in our next blog. So stay tuned to learn more about the history of American made furniture! You’ve bought new furniture. You’ve gotten your new furniture home. Now you’re in your bedroom or living room or dining room, trying to place the pieces. You’ve tried 10 different arrangements already and nothing looks right or feels right. What gives? There are several common mistakes people make when arranging furniture in their home. Here we’ll take a look at a few of those. Did you measure the room before you bought the furniture? The number one common mistake people make is in not measuring the room before buying. New furniture is exciting, we absolutely agree but take the time to make sure that what you’re buying fits in your home. Are you balancing the room? If all of the big pieces are crowded to one side of the room, it will be off-balance horizontally. If much of the furniture is either too bottom-heavy or too top-heavy, a room will be off-balance vertically. How many focal points do you have? Often times, people will have more than one focal point which will throw off the room. If a huge art piece is your focal point, don’t have a huge television sitting across the room from it. A common home decorating mistake is placing all pieces of furniture against the wall. Homeowners mistakenly think that doing so will make the room look larger. You can make the room look larger by placing some of the pieces in groups in the middle of the room. 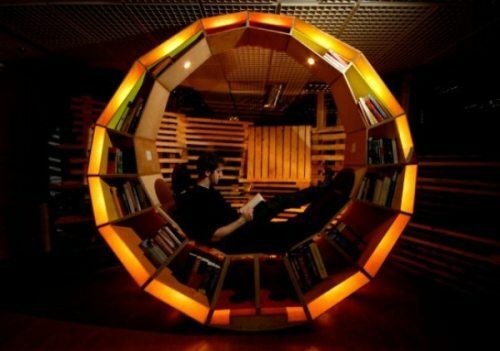 Experiment with your furniture arrangement and settle for the one that is best aesthetically as well as functionally. Try to achieve an airy and spacious atmosphere by moving those chairs from the corners and trying out different arrangements. 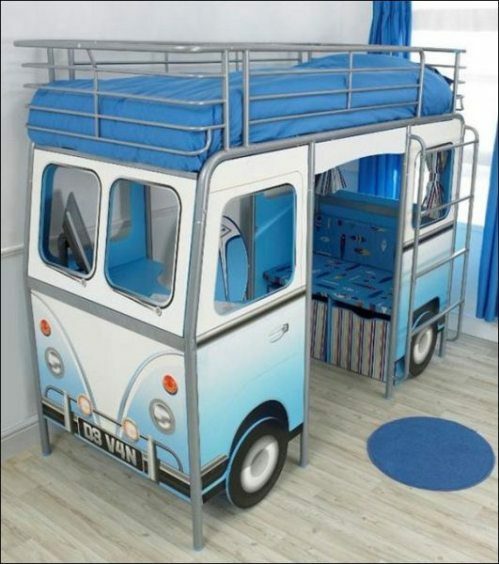 Make sure traffic can flow easily through the room. Don’t block doorways and make sure there’s plenty of space to walk around and through the room. Don’t try to do it all at once! Give yourself time to find what works best for you. There’s no need to rush through placing your furniture and it will still take you a couple of tries to find the perfect fit even with these tips. If you’re ready for some new furniture to place in your home, drop by our website or show room today!